A 2000-seat multi-use venue envisaged to rival the world-famous Sydney Opera House is set to b built as part of plans for The Opera District in Downtown Dubai, developer Emaar has announced. To be used for opera, theatre, concerts, art exhibitions, orchestra, film, sports events and seasonal programmes, Emaar said it would be the centerpiece of the district to promote the arts, culture and events scene in Dubai. 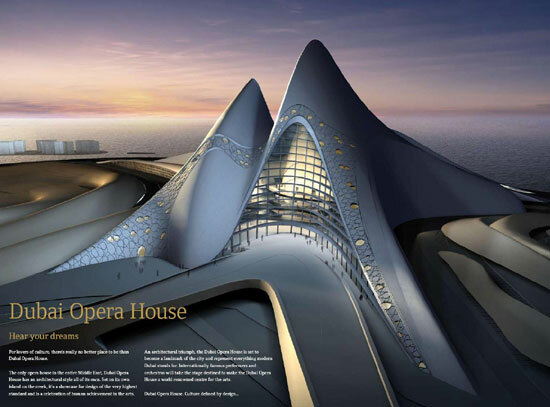 Styled on the traditional sailing vessels of the Arabian Gulf, the classic wooden dhows synonymous with Dubai Creek, the “bow” of the planned building will contain Dubai Opera’s main stage, orchestra and seating areas, as well as the proposed sky garden and restaurants. The elongated “hull” area will feature waiting areas for spectators, a taxi-drop off area and parking amenities. Emaar said The Opera District, which is accessed via Mohammed Bin Rashid Boulevard and faced Burj Khalifa, Burj Park, and The Dubai Fountain, will also feature luxury hotels, residential and serviced apartments, a retail plaza, waterfront promenades, recreational spaces and parks.